Just eight days before the Nov. 11, 1918 Armistice ending World War I, my great uncle, Ira Pitzer, was killed during battle in France. His mother was overcome with grief for the rest of her life, a tragedy shared by so many families who have served in the military. Veterans Day is to honor the service and sacrifice of the men and women in the armed forces. 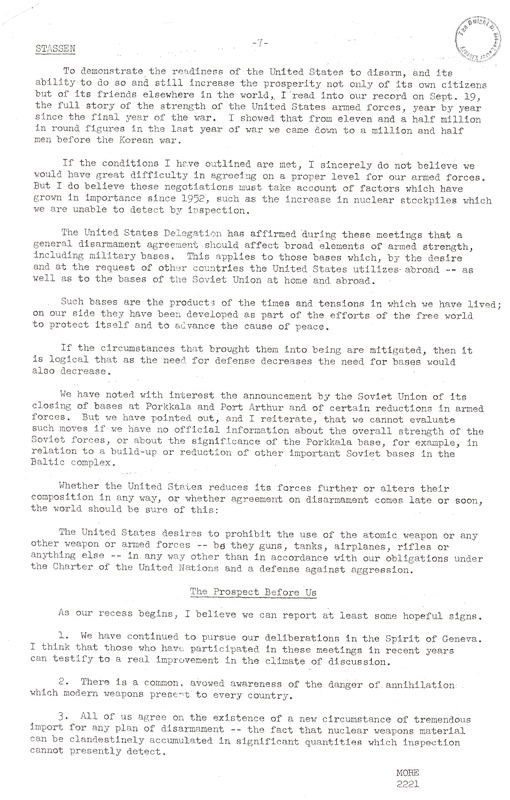 But Veterans Day also should mean something more, an inspiration to win a lasting peace. Tagged as Armistice Day, history, hunger, Veterans Day. By 1 June, about 40,000 people displaced from Abyei after the town's takeover by Sudan Armed Forces had been registered in the Abyei area, Unity State and the greater Bahr El-Ghazal region and were receiving humanitarian assistance. Photos: UNMIS/Issac Gideon. This Wednesday, when Villanova University squares off against Seton Hall, you can expect another competitive Big East Conference basketball game. This game will differ from others in that it will seek to build support for Peace in Sudan. Villanova and Seton Hall are partnering with Catholic Relief Services (CRS) in “Playing for Peace” to help bring an end to conflict, hunger and suffering in Sudan and South Sudan. Sudan and South Sudan fought a decades-long civil war that ended in 2005 with a peace agreement. However, violence has continued and the agreement has not been fully implemented. Peace activism will take place throughout the game. 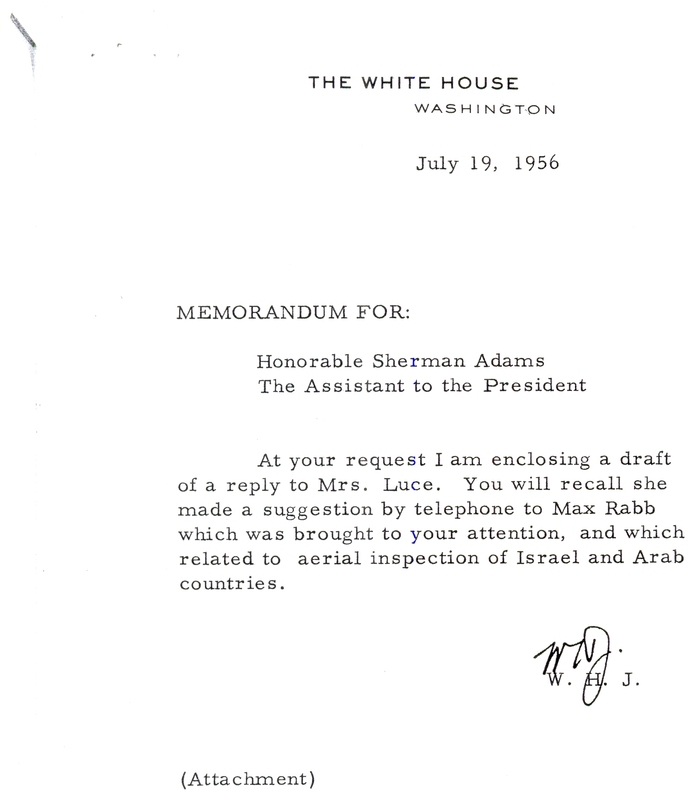 Students will be handed a flyer showing how they can help by contacting the White House and urging the administration to support the peace process. South Sudan became the world’s newest country last July, gaining independence from Sudan. However, peace in the region remains elusive as conflict and border tensions continue. It is critical that UN peacekeeping missions be supported and fully funded to protect civilians, and help establish conditions to build a lasting peace and development. A peacekeeping mission called UNISFA was deployed to Abyei, which is a disputed territory on the border between Sudan and South Sudan. This oil rich region is claimed by both Sudan and South Sudan, and fighting has taken place there for years despite the 2005 agreement. UNISFA is there to make sure the area is demilitarized and made safe for civilians. The threats go beyond the guns. Hunger and poverty still dominate the countryside. Drought often harms food production efforts and malnutrition is a major threat to children. Displacement from conflict makes this situation even more desperate. Conflict exists not only between South Sudan and Sudan, but also between rival tribes. At this very moment, aid agencies are trying to help 50,000 displaced persons in the Jonglei State of South Sudan. CRS reports that the ethnic conflict between the Lou Nuer and Murle tribes has claimed an estimated 1,000 lives in the past six months. One of the driving forces behind this internal conflict is the lack of resources. Hunger and poverty feed desperation and violence. Will there be enough resources for aid agencies to reinforce the drive for peace? CRS is sponsoring emergency aid as well as long-term food security projects. The UN World Food Programme (WFP) is reporting that its 2012 relief operation for South Sudan is short 179 million dollars. 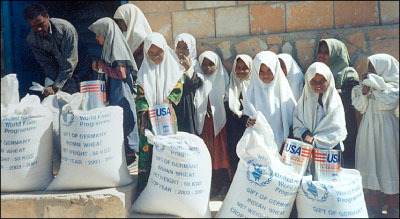 WFP relies entirely on voluntary donations from governments and the public. Without food, children in Sudan will suffer lasting physical and mental damage, thereby stunting the next generation. Without food for schoolchildren, education will suffer. A national school lunch program still needs to be established. Playing for Peace is part of a series of events about Sudan sponsored by Villanova University. For more information, please visit the CRS newswire. Article first published as Big East Basketball to Shine Light on War-Torn and Hungry Sudan on Blogcritics. 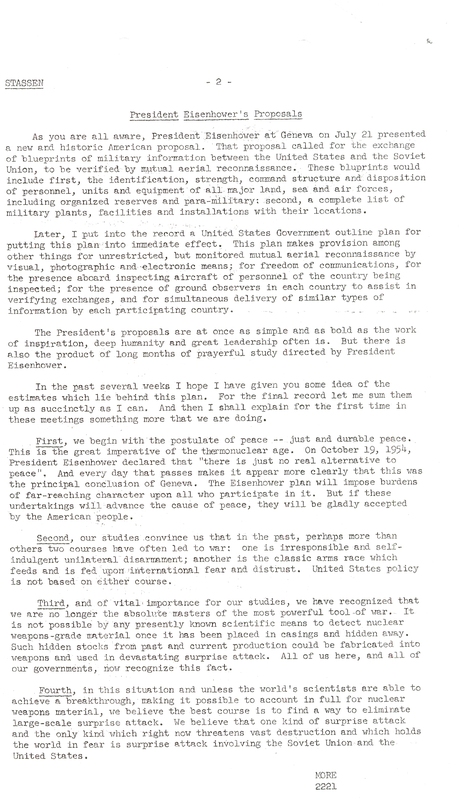 On October 5, 1947 the first presidential address ever televised from the White House was delivered by Harry Truman. The President discussed the urgent hunger crisis facing Europe and how Americans could help through food conservation. At that time Europe was struggling in its recovery from World War II. Rebuilding from the devastation was difficult enough, but a harsh winter followed by a drought during 1947 ruined crops. 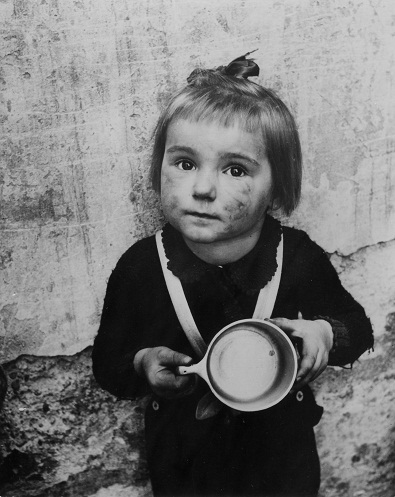 Food shortages were rampant and Europe needed food to survive and rebuild. 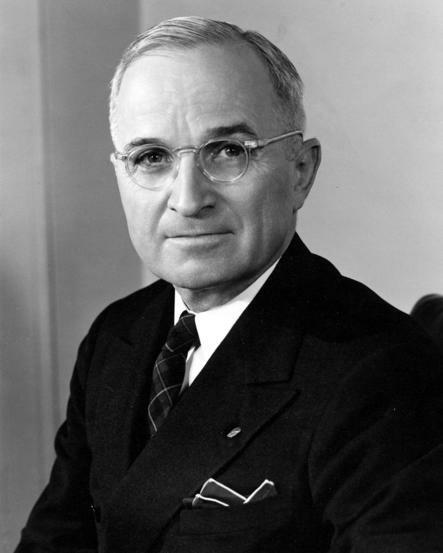 President Truman said of Europe, “The nations of Western Europe will soon be scraping the bottom of the food barrel. They cannot get through the coming winter and spring without help–generous help–from the United States and from other countries which have food to spare. Food from the United States helped Europe get through the winter of 1947-1948 and helped set the foundation for the Marshall Plan. It was this initiative that brought about Europe’s recovery. 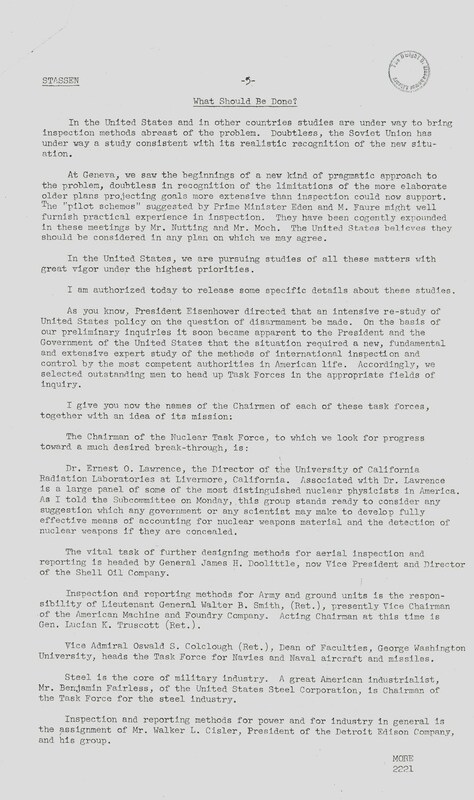 In addition to President Truman, other speakers for the program included Secretary of State George C. Marshall, Secretary of Agriculture Clinton P. Anderson, Secretary of Commerce W. Averell Harriman, and Charles Luckman, who was the Chairman of the Citizens Food Committee. 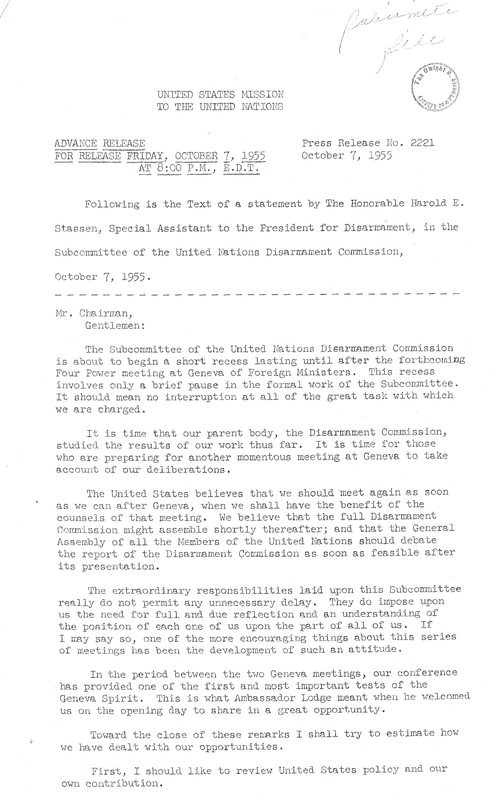 Read the full text of President Truman’s October 5, 1947 statement. As fighting intensifies in Yemen’s capital of Sanaa, the UN World Food Programme (WFP) has been forced to limit hunger relief operations in that area. The United Nations is evacuating some of its staff from Sanaa. WFP is carrying on its relief operations in other parts of Yemen, a country with one of the highest rates of hunger and malnutrition in the world. 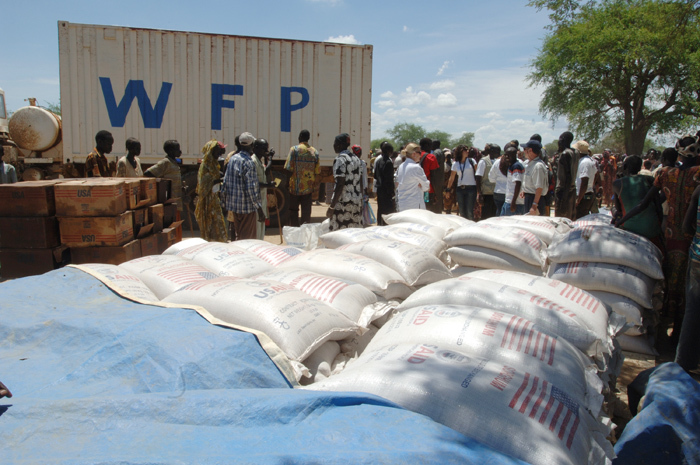 The WFP mission is plagued by a lack of funding and an inability to reach all of the needy. WFP relies on voluntary funding from governments and the public. What started earlier this year in Yemen with peaceful demonstrators seeking freedom from a corrupt President has now evolved into a shootout between rival factions seeking to gain power. The fear now is that civil war could erupt in Yemen which will bring immense human suffering. Millions of Yemenis are already deeply mired in hunger and poverty. Many are getting by on very little sustenance as it is. A civil war will push Yemen closer and closer to famine. Yemenis have had to bear the brunt of years of internal strife and poverty. The World Food Programme currently is feeding displaced persons in Northern Yemen who suffered through years of conflict between the government and rebels. In Southern Yemen thousands have been displaced this year from fighting between the government and suspected Al Qaeda militants. WFP is feeding them as part of an emergency safety net operation which is intended to reach over 2 million Yemenis, although lack of funding has hampered this operation. Throughout most of Yemen, families can barely afford bread as food prices are high. These prices have skyrocketed since protests against President Saleh began earlier this year. Yemen also needs humanitarian aid and every effort must be made right now to ensure that it can flow.The international community has to stand by Yemen. This means full funding for World Food Programme and UNICEF operations. Food stocks have to be ensured. UNICEF , which feeds malnourished children, needs to have a full supply of plumpy’nut food and medicines to reach all suffering children in Yemen. Tens of thousands of children die in Yemen each year from easily preventable causes. The situation could deteriorate even further. About a week ago, there was at least some hope of a peaceful settlement and transition of power. There was a back-to-school campaign to be launched that UNICEF was promoting with Yemen’s ministry of education. This was a project full of hope that could build Yemen’s future. But then the fighting began. To sign a petition supporting humanitarian relief in Yemen, visit CARE 2 . For the latest breaking news on the crisis, see the New York Times with Laura Kasinof reporting from Sanaa. Article first published as Yemen Nears Breaking Point, Humanitarian Crisis Could Worsen on Blogcritics. Could Yemen be the Next Somalia? U.S. Wants Change in Yemen, But Where Is the food? 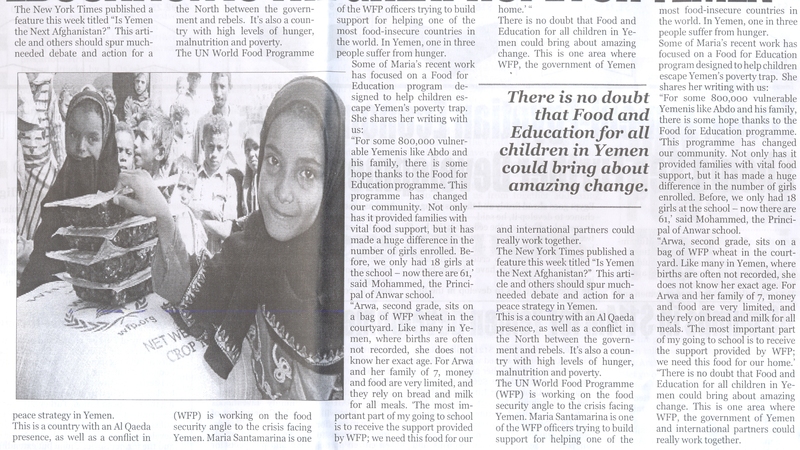 WFP also hopes to run a Food for Education program to give Yemeni children rations and encourage class attendance. This program has suffered from such a lack of funding that WFP has reduced its planned beneficiaries from 115,000 down to 59,000. Catherine Herridge of Fox News just published a story about the growing threat of Al Qaeda in Yemen. Political instability in Yemen this year, with protesters calling for the removal of President Saleh, has weakened the ability of that government to tackle the Al Qaeda threat. 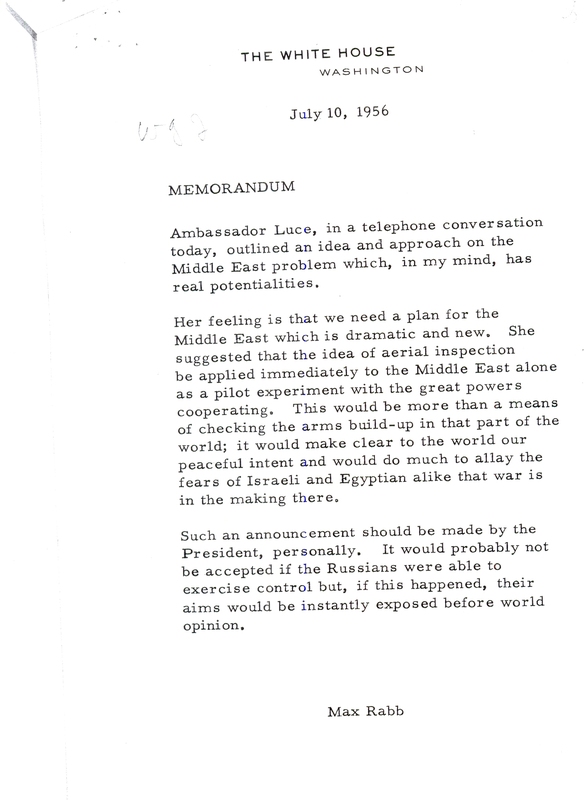 But it’s critical when having the discussion of Yemen to also go beyond Al Qaeda and the political turmoil. Far less reported are areas where the international community can take action immediately: hunger and malnutrition. 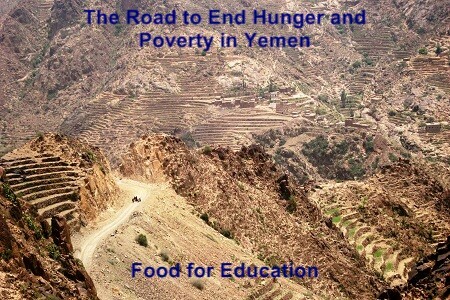 Food for hungry Yemenis will be a most crucial oasis of calm in the storm of political unrest and Al Qaeda. As we speak, millions of Yemenis are being crushed by high food prices. They cannot access basic foods. This was a crisis even before the Arab Spring came along. The political unrest has made it much worse. There are severely malnourished children in Yemen who could be saved with a simple intervention. Because these children are the future of that country, it’s crucial that those in power remember this when making Yemen policy. The first step the international community can take is to boost the UN World Food Programme’s response to hunger in Yemen. Currently, WFP operations have received low funding and cannot reach all the hungry. Their plan involves emergency rations to help families afflicted with high food prices. But low funding means not all needy families can receive the rations. 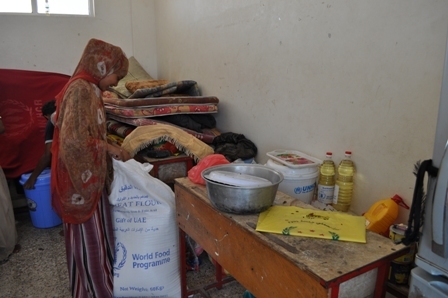 In addition, WFP is feeding the displaced in Southern and Northern Yemen. An investment of around $60 million would ensure that full rations could be provided. Spread out over a coalition of nations, this is a relatively inexpensive investment. Second is support for UNICEF’s work in treating malnourished children. This is most crucial for building the future of Yemen. A full supply of plumpy’nut needs to be shipped to Yemen as soon as possible to cover all the malnutrition cases. Again, this is another relatively small investment in the millions of dollars. The third phase is to include Food for Work projects to build infrastructure and improve agricultural development. A national school lunch program including a take-home ration element will need to be instituted. This will be an effort with the government and communities working together. For instance, local shop owners and farmers would ideally become suppliers, at least in part of the school feeding program. Food is a critical component of any peace plan for Yemen. It will strengthen the people of Yemen so they can better resolve these crisis areas. For food is the foundation of all things, whether it is peace, political stability, education, or economic development, all of which will inhibit Al Qaeda’s growth. 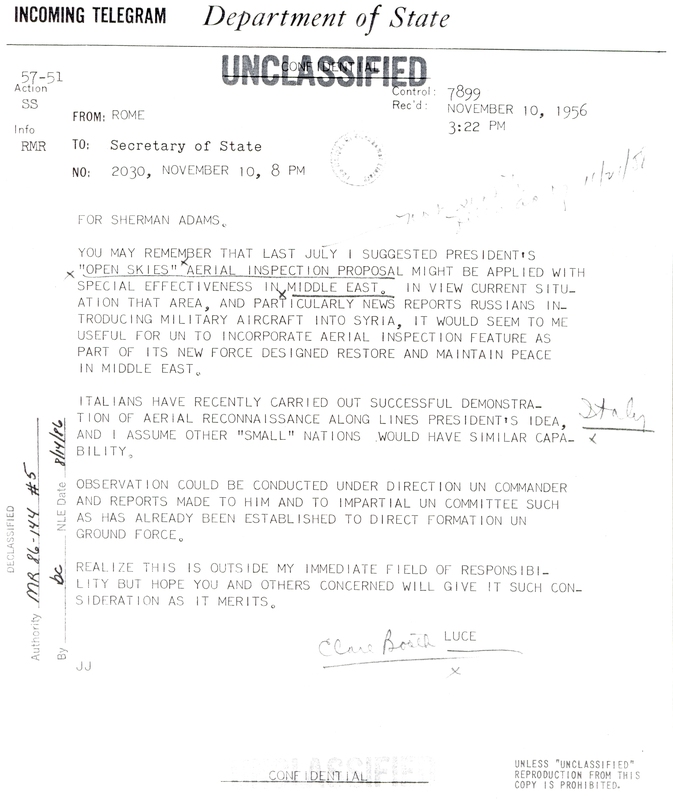 Article first published as In Yemen’s Arab Spring, Crucial to Look Beyond Al Qaeda on Blogcritics. 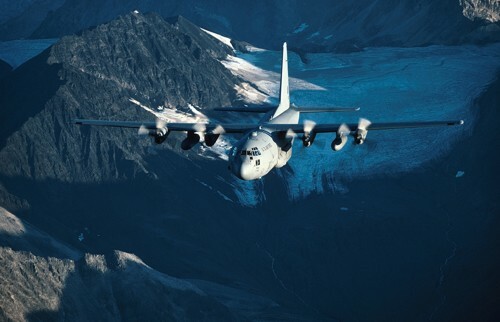 Contributing to the development of peace worldwide by the creation of an Open Skies regime for aerial observation. 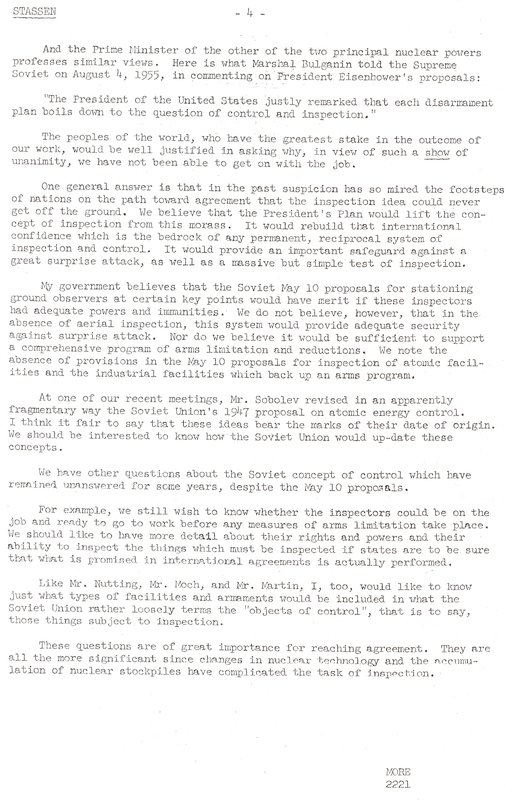 As the Cold War and the nuclear arms race escalated President Dwight Eisenhower offered the “open skies” peace initiative to the Soviet Union at the Geneva Conference in July, 1955. 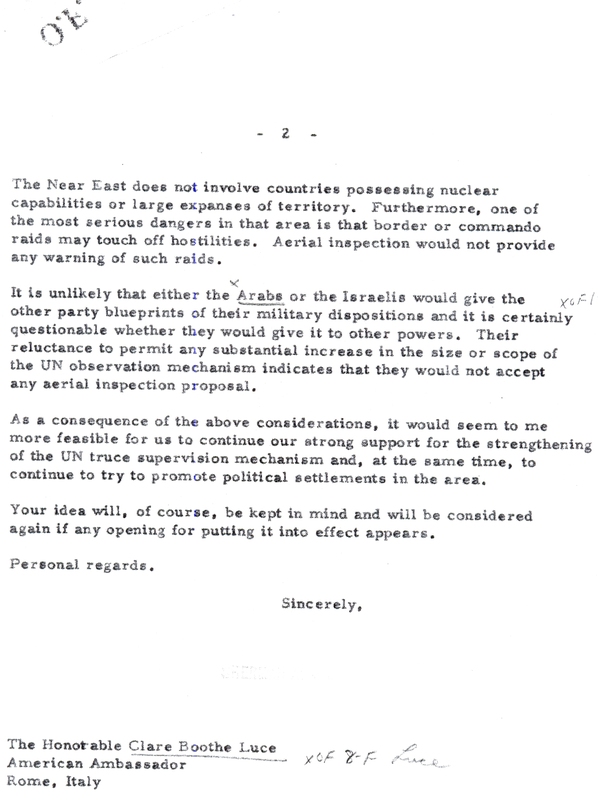 The idea was to allow peace planes from each country to fly over the territory of the other to inspect military forces and make sure no surprise attack preparations were taking place. 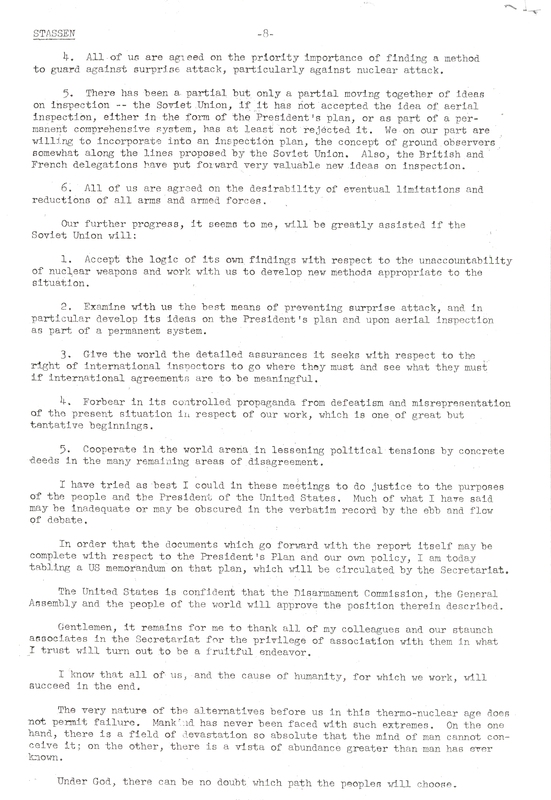 Watch the news video of the Geneva Conference followed by President Eisenhower explaining the purpose of open skies. You will also see a sample flight. 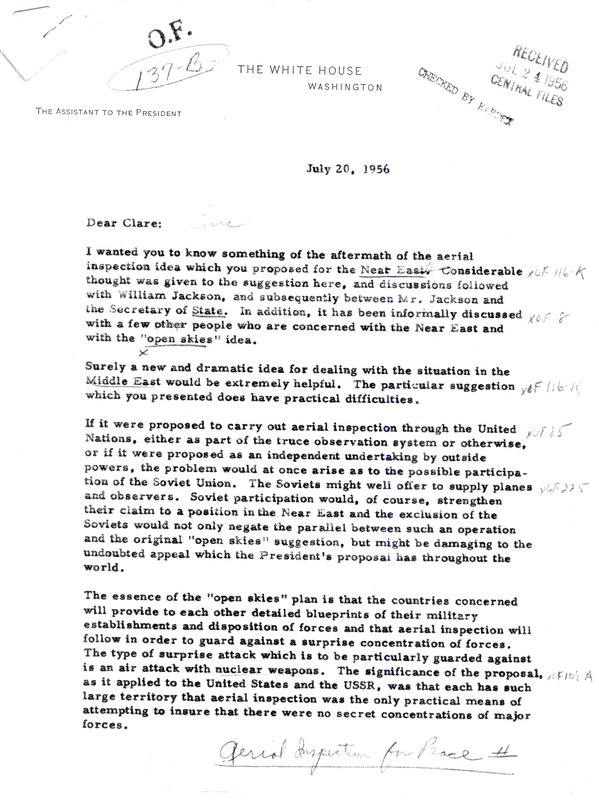 The Open Skies Plan was not accepted in 1955 but it was revived by President George H. Bush in 1989. 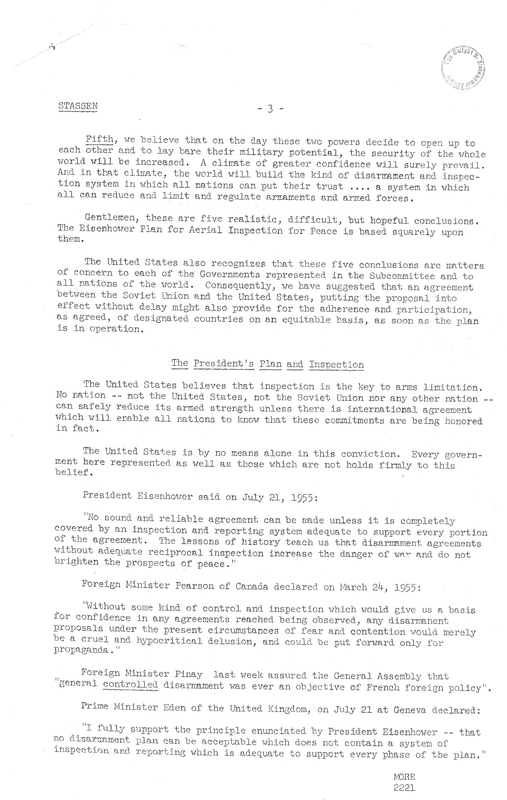 This led to the Open Skies Treaty of 1992 which included the United States, Canada, Russia and a number of nations in Europe. Watch this video about the treaty. 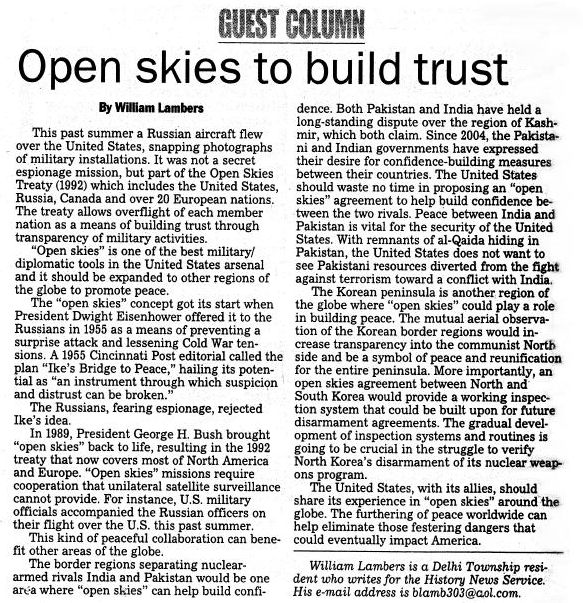 Can Open Skies Be Expanded to More Nations? 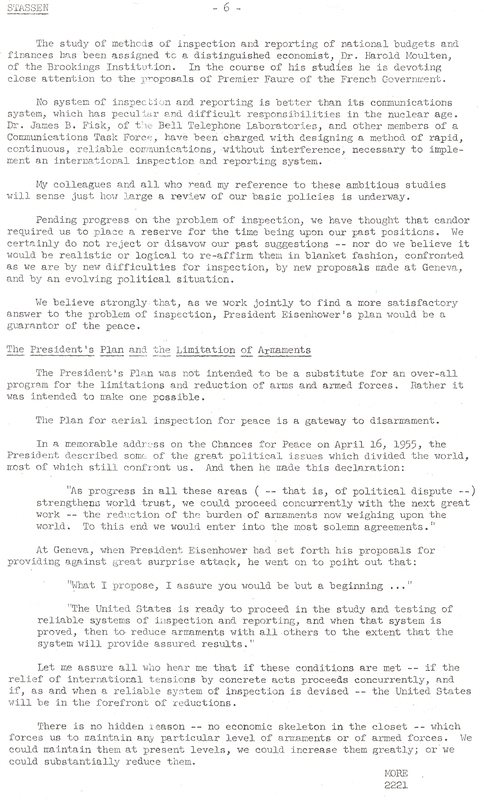 “Open Skies” can play a role in the Korean peace and disarmament process. Click here to read the article in the San Diego Union-Tribune. 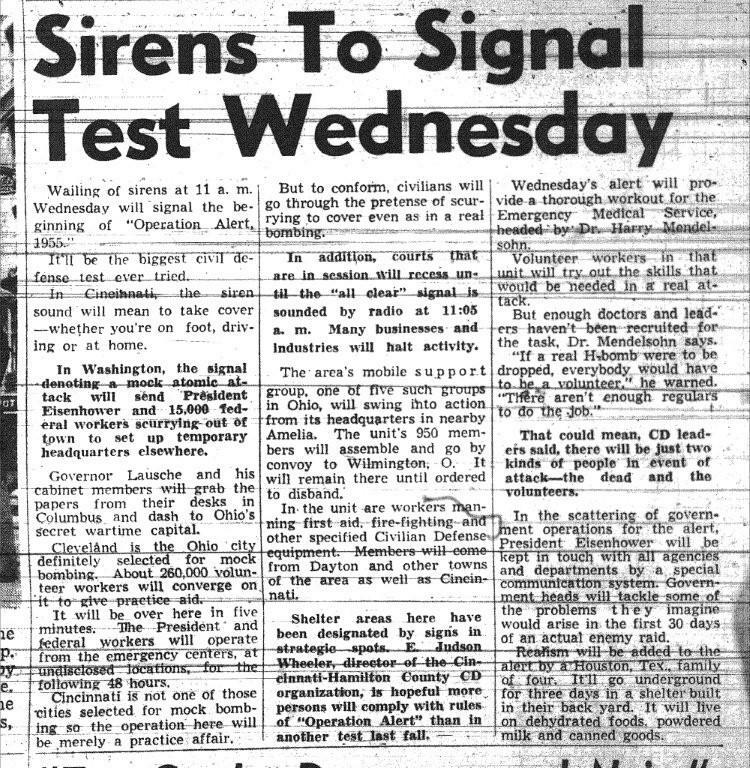 Over a month before the Open Skies proposal this article appeared in the Cincinnat Post (June 14, 1955) about Operation Alert, a civil defense drill against nuclear attack. 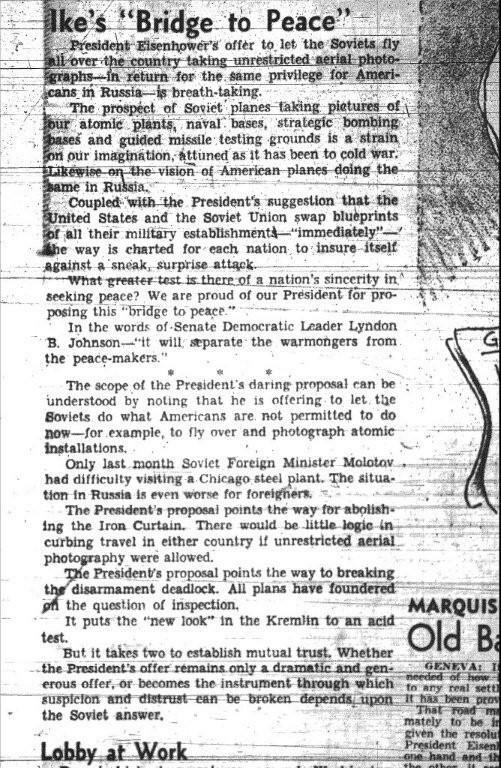 Article in July 22nd, 1955 Cincinnati Post about Ike’s “Open Skies” proposal. Russian “Open Skies” mission over the United States.